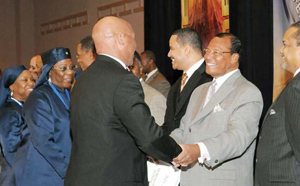 The Honorable Minister Louis Farrakhan has introduced Black America and the world to modern equipment, which will help in the salvation and liberation of Black people in America and others who are poor, downtrodden and oppressed. Min. Farrakhan spoke briefly and shook the hand of every graduate during Saviours' Day ceremony. It's been a busy couple of weeks...not over yet.